Prior to traveling to Thailand in 2009, my knowledge of Thai food was limited to pad thai and things involving spicy peanut sauce. After spending a month there, I lost seven pounds, even though I was eating constantly and loving it all. The culprits? Lots of fresh fruits and veggies. The heat and humidity probably didn't hurt either. When I came back I discovered the H-mart, the big Asian grocery store here in Denver where I could find many of the specialty ingredients for Thai cooking - and at a much better price than King Soopers. For Christmas I asked for a cookbook of easy Thai recipes. I received the book Quick & Easy Thai by Nancie McDermott. The nice thing is that substitutions are offered for ingredients you might not be able to find (ie using brown sugar in lieu of palm sugar). Over Memorial Day weekend we were in New Mexico and hit up Trader Joe's. They had basil plants on sale for $2.99 and I thought "what a great idea! I can use it for fresh basil all summer." Fresh basil is usually between $.50-1.00 a bunch at the H-mart and much more expensive at your standard grocery store. The sad fact? I was unable to keep the basil plant happy and finally it gave up the ghost. Too much sun, not enough. Too wet, too dry. ﻿It went from four stalks down to one last sad limp looking stem. And then one day it was gone. 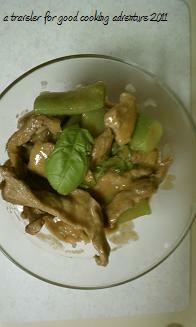 This was one of the last recipes that benefited from the short life of this basil plant. In a medium saucepan, stir together 1/2 cup of the coconut milk and the water and bring to a very gentle boil over medium heat. Spring in the beef, stirring to keep the pieces from sticking together, and simmer five minutes, until meat is tender. With a slotted spoon, scoop the meat out into a bowl and set aside, leaving milk in pan to return to a gentle boil. Stir in the curry paste and cook, pressing an stirring to dissolve the paste, 3 to 4 minutes, until the sauce is fragrant and smooth. Return the beef and any juices to the pan, add the remaining 1/2 cup coconut milk, and bring back to a gentle boil. In an attempt to get some more vegetables in my diet, I added green beans at this time. Add the fish sauce, sugar, peanuts and lime leaves. Stir well and simmer 3 to 4 minutes, until sauced is smooth. Stir in the basil leaves and remove from heat. Serve over rice or noodles (or just eat it right out of the bowl).